This chapter reflects on the evolution of queer representation on American television and shows how LGBT+ characters exemplify a specific moment in time. 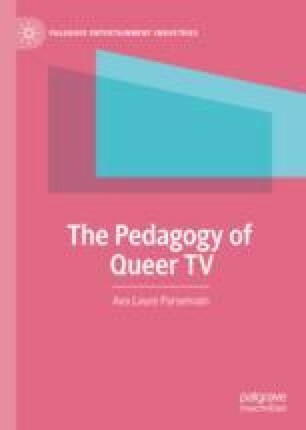 Drawing on previous studies, it pays particular attention to groundbreaking programmes from the 1990s and 2000s like Ellen, Will & Grace, Queer as Folk, Queer Eye for the Straight Guy and The L Word, which revolutionised television by increasing LGBT+ visibility and challenging stereotypes. No longer demonised and ridiculed, TV gays and lesbians of that era entered mainstream culture. However, as this chapter demonstrates, this “gaystreaming” strategy was problematic because it privileged a narrow segment of the LGBT+ community (namely, white gays and lesbians), overlooked structural issues and erased queerness by promoting assimilation and normalisation.